Not to be confused with News presenter. Anchors are used to stop boats from moving. Today, anchors are usually made of metal, and they are made to catch the ocean floor (the seabed). There are two main types of anchors: temporary and permanent. A permanent anchor is called a mooring block and is not easily moved. A temporary anchor can be moved and is carried on the boat. When people talk about anchors, they are usually thinking about temporary anchors. An anchor works by either weight (mass) or shape. Shape is more important to temporary anchors, and design is very important. Anchors must resist wind and tide, and also the up-and-down movement of waves. The oldest anchors were just rocks, and many rock anchors have been found from a long time ago. Many modern moorings still use a large rock as the mooring block. A simple anchor which uses two arms made of wood, and a rock weight, is an anchor which is still used today. The wood arms are sharp to enter the seabed, and the weight will hold normal movement. The English language uses several special words to describe parts of anchors. This is because England has a rich marine and naval history, and so the language gives a large number of words to boat and ship terminology. 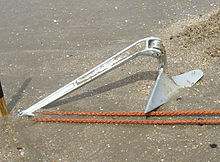 A modern temporary anchor usually has a middle bar called the shank, attached to a flat surface (traditionally called fluke) which holds the seabed. The place where the shank meets the fluke is called the crown, and the shank is usually fitted with a ring or shackle to attach it to the rode (cable, chain, or rope joining the anchor to the boat). Some old anchors have attached to the shank a stock, which is a bar that places the anchor in a certain way when it falls on the seabed. Old anchors are often named "stocked" or "stockless" anchors depending on whether they have this, or not. Hook designs use small flukes with a heavy, narrow fluke-arms to go deeply into difficult seabeds. Plow (also spelled "plough") bury themselves in the bottom as force is applied to them. They look and work like a farmer's plow. The first was the CQR, first made in 1933 in the United Kingdom. They do not hold as well as modern anchors. Fluke or plate designs use large flukes to develop good holding. They hold well but are difficult to make set (go into the seabed). Over the last 20 years, many new anchor designs have appeared. These anchors are usually designed for small vessels, and are usually not for large ships. See modern designs. The Fisherman has a traditional design that has not changed much over time. It is less useful than a good modern design, and its holding power for its weight is among the worst of all anchor types. The most common type of fluke anchors is the Danforth. The Danforth style uses a stock at the crown (see above), to which two large flat flukes are attached. The stock can rotate, so the flukes can move toward the bottom. It can hold very well but has difficulty setting (entering the seabed) on its own. It is efficient for its weight. Fluke anchors have difficulty penetrating kelp and weed seabeds, as well as very hard sand or clay seabeds. Once set, the anchor can come free and fail to reset on its own. A traditional design, the grapnel style is simple to design and build. It is a simple hook that is good for rock or reefs. It is useless for most other seabeds. The original CQR was invented in 1933 in the United Kingdom. Many copies of it now exist. Plows used to be popular with sailors and private boaters. They are good but not excellent in most seabeds. Another more recent design is the Delta which is better. Plows use a special weight in the tip of the fluke (the toe) for them to work properly. This makes them heavy. The genuine CQR and Delta brands are now owned by Lewmar. The genuine Bruce was invented in the 1970s and to try to solve some problems of the plow. Many copies are now made. This type of anchor is now called a "claw-type". Claw anchors can set quickly in some seabeds, but do not hold well for their weight, and can let go very suddenly. Bruce Anchor Group no longer make the genuine Bruce. Most copies are lower quality than the genuine Bruce. Modern anchors are designed to be better than the plow and claw types. Many are new, still under patent and owned by commercial companies or tied to certain brands. The Bulwagga has three flukes instead of two. It has done well in tests by independent organizations. The Spade has been well accepted since 1996. It performs well. The Rocna has been made since 2004. Like the Bügel', it has a sharp toe and roll-bar for weed and grass. It sets quickly, and has a large fluke area. Its roll-bar is similar to the Bügel's, and ensures the correct setting angle with low weight on the tip. The Rocna got the highest averaged holding in SAIL magazine's testing in 2006   . Chart comparing holding ability of different anchors. Many modern designs are better than the older types. This chart shows tests done by West Marine (an American marine shop) in 2006 . The anchors were tested on three different sandy seabeds, at three different scopes (pull angles). Six of the seven best anchors on this chart are "modern", but several modern anchors did very badly. This shows that 'newer' is not always better. Permanent anchors are used when a floating thing must be kept in place for a long time. They are used to anchor Lightships, navigation buoys, and moorings. The anchor must hold in all weather, even the worst storm. A deadweight anchors is a heavy weight. It can be used when the bottom is too hard for other types of anchors. It can be made of a large rock or a concrete block. Mushroom Anchor on the Lightship Portsmouth in Virginia. Mushroom and pyramid anchors are good where the seabed is soft. This type of anchor needs time to dig into the seabed. It can be smaller and lighter than a deadweight anchor. The mushroom anchor is shaped like a mushroom, and the pyramid anchor is shaped like a pyramid with the apex pointing down. The sand screw must be screwed into the seabed before it is used. It can be very light. This page was last changed on 9 March 2019, at 10:19.